Jumanji The Game | Most Screen Accurate Wooden Replica! When you think about magic, about mystery and wonder and your childhood, there is a good chance that you think of the movie, Jumanji. This is a movie that has sparked the imagination of a generation, and conjures thoughts of wonder and amazement. A movie with strong themes, powerful characters and the humour of Robin Williams, Jumanji has stayed in the minds of hundreds of fans over the years. Jumanji revolves around the story of a young Alan Parrish, who discovers a strange and unusual board game. When he plays it with his friend Sarah, he is transported into the jungles of Jumanji, within the game itself. There he stays for 26 years, presumed dead by his parents and friends. Decades later, two children, Peter and Judy Shepherd, explore an old mansion, only to find the board game in the attics. They decide to play it, unleashing the magic of the game, and freeing Alan, who is now a grown man. Alan explains that if they win the game, he will be freed for good. On their adventure, they encounter giant bugs, stampedes of rhinos and many, many more dangerous creatures, and people! This film is fraught with dangerous pursuits and emotional moments, touching on the bonds of family, friendship and the importance of being brave in order to help ones friends. Peter and Judy battle all manner of dangers in order to save their friend, including the hunter, Van Pelt, various bugs and the dangers of a jungle. The board game that causes so much adventure and excitement can now be yours to own. The original board game prop is not for sale anywhere, and no one has made a replica that truly captures the detail an essence of Jumanji- that is, until now. An entirely accurate and functional board game has been created, based on the famous prop used in the movie itself. The board game is created by a professional woodwork expert, who has used many, many images from the movie as a reference for the screen prop itself. The board is made out of African mahogany wood and is hand painted and stained. This set includes 4 Tokens, as well as dice. For those familiar with the movie, the tokens Elephant, Rhino, Monkey and Crocodile will be familiar reminders of the film. The tokens have been cast in resin and are painted according to the movie. This replica is completely screen accurate down to the very last detail. The board game has been crafted with a great amount of care, highlighting the passion and professionalism that has gone into making such a well-crafted piece of film legend. 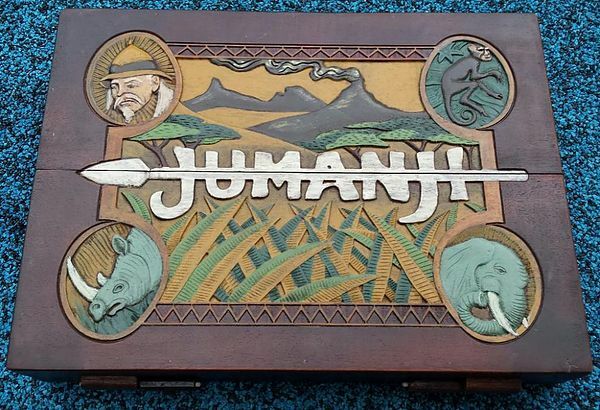 It is hard to understand why such an accurate replica was not made previously; but fans will finally get their chance at owning a true Jumanji board game, instead of a rip off. So if you are a fan of the movie, with a passion for accuracy, realism and craftsmanship, this is just the thing for you!